"I wish they all could be California girls." Classic Beach Boys comes to mind when I think of my youth and the beach. Now you can share in the memories with this whimsical ode to all things beachy. 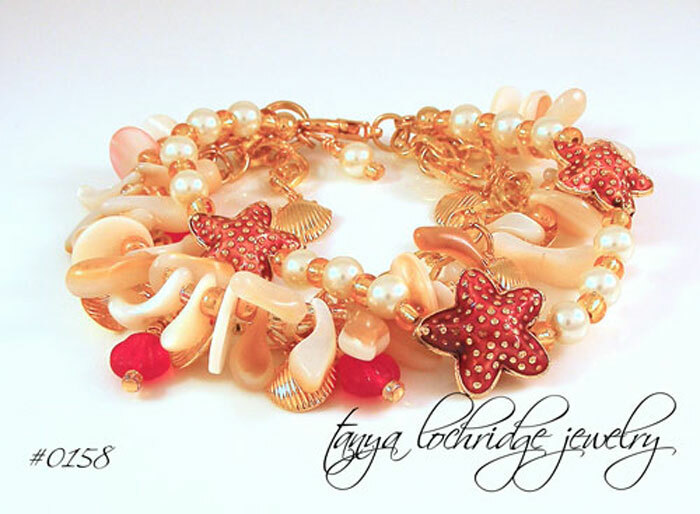 Cloisonné rusty-red starfish are partnered with ivory Czech glass pearls and different shells in the buff. Small gold-plate shell charms and Czech red glass shells dance along the linked chain. This 3-strand charmer is 7 1/2" long with a 1 1/2" extender and has a top-quality textured gold-plate lobster clasp. Something in me thinks this would be the most interesting bracelet for your bridesmaid for the fun wedding you've got coming up. Yes? Handmade in the USA using domestic and imported components.